Lots of wonderful, magical things have been found in pension files. I'm not speaking solely of information. 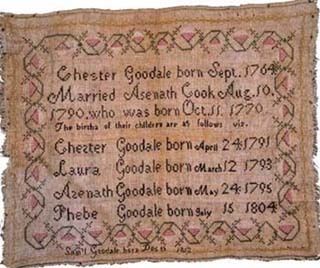 For example, there is the needle work sampler found in the Revolutionary War pension file of Chester Goodale. I recently read of another item, decidedly on the strange side. Just recently someone came across a piece of clothing that a corpse wore for three years before the piece was removed and placed in the file! It's a story with intrigue, tragedy, a disinterred corpse, larceny, mystery, fraud, a lethal gunshot to the head, a potter's grave, war, and a gingham apron. Who says genealogy can't be compelling? Learn the whole story at "Civil War Conservation Corps Reaches a Significant Milestone." For more information about samplers in the National Archives, click here. Do you have any more of the details of the Ancestry.com takeover of Footnote.com?? as a long time subscriber to Footnote I am very concerned about my Footnote subscription being useless soon. Your thoughts please. Oh, AI, there are indeed gems in the files. There are beautiful frakturs, my distant cousin's prosaic printed family record, an astonishing list of people who took the Oath of Allegiance in PA in 1777, and ~not least~ one of the few surviving pages of records of a Mohawk Valley, NY church. I note in one photo at your link, with some dismay, that the volunteers sorting through the original files are not wearing gloves. I would like to comment that the volunteers are not instructed to wear gloves when handling paper as it is not safe to lose the tactile feeling that bare hands provide. More harm than good can come to paper from gloves. They are instructed to always wash their hands before working with original documents. These procedures are established by NARA's preservation department, and the same rules apply to NARA's digitization and microfilm staff as well as to the public in the research room. Please note that gloves are required when handling any type of photograph.